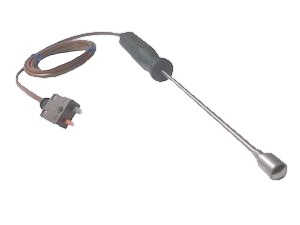 This ribbon surface thermocouple probe uses flat ribbon technology that enables fast, accurate response, within half a second, whilst ensuring minimal heat loss from the object being measured (which would lead to an accurate reading). This makes ideal accurate measure of small or thin objects, which have low thermal mass. The sheath is 8mm diameter and 130mm long below the handle. The lead is PVC insulated 1m long and terminated in a thermocouple mini plug.